Premier Futsal OFFICIAL VIDEO 2016: The official video of Premier Futsal (Futsal Anthem) has released by the AR Rahman on Yesterday (July 07, 2016) on his official social network. Here we updated the Premier Futsal YouTube Video from UnisysMusic. The Premier Futsal will start on July 15th of this year 2016 in India. So, AR Rahman and Indian Cricket Player Virat Kohli featured in this video. Both of human has more fans in India on their respective department. 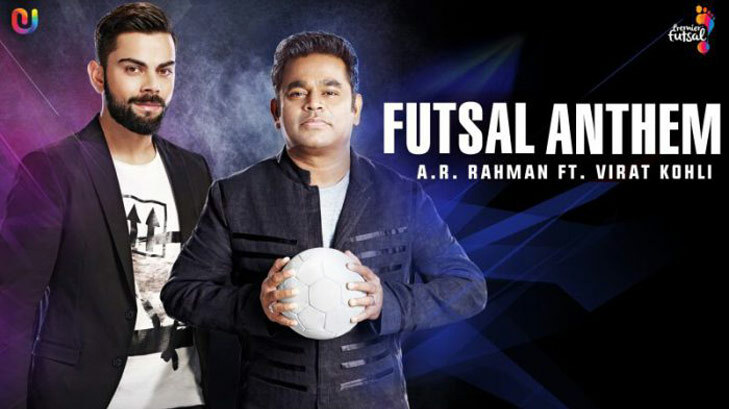 AR Rahman showed his floor steps by this Premier Futsal Video. We all already saw our AR Rahman on his own song as just a singer. Here it is one of his rare videos as a dancer. Virat Kohli shared his lyrics parts and also on the dance floor. Scroll down and watch the Premier Futsal Anthem Video. This Premier Futsal is the first season to be held in the country of India. This Premier Futsal will be conducted for Three weeks in this year with the International Football Legends as a team ambassadors. There are 21 countries from the Four Continents will show their best talent via Premier Futsal 2016. It is like an Indian Premier League but in the Football. There are 23 matches which will be held at the Eight cities across India. It is a time for all the Indian Football fans to enjoy their moments with Premier Futsal 2016. This Premier Futsal was an idea of Indian entrepreneurs Abhinandan Balasubramanian, Dinesh Raj and Nithyashree Subban, backed by business magnate Xavier Britto and his wife, philanthropist Vimala Britto. The Indian Cricket Player, Virat Kohli has signed as the brand ambassador for this Premier Futsal before. This League will be conducted under the entity Premier Futsal Management Private Limited.